A cybernetic warrior from a post-apocalyptic future travels back in time to protect a 19-year old drifter and his future wife from an most advanced robotic assassin and to ensure they both survive a nuclear attack. More than 10 years after T2 we got T3. John Connor is now a grown up man who tries to live “off the grid”, so that Skynet is not able to track him down. Unfortunately, Skynet sends the T-X back in time to kill him and his future resistance lieutenants. The T-X is played by Kristinna Loken. Kristinna Loken is an acceptable villain (the first female Terminator). Kristinna Loken has great physics, but she is not as scary as Arnold Schwarzenegger in T1 and Robert Patrick in T2 (Robert Patrick’s T-1000 from T2 is still my favorite villain Terminator). Arnold Schwarzenegger is back as the T-850 (I think he is an upgraded version of the T-800 from T1 and T2). This is Arnold Schwarzenegger’s signature role and he mostly does a great job. The Terminator saga would not be the same without his portrayal of the killer machine from the future. This time Sarah Connor is not in the movie (she is dead in this timeline). I missed Linda Hamilton as Sarah Connor, but I guess this is John Connor’s movie. Nick Stahl is playing John Connor (the future leader of the human resistance). John Connor is portrayed as a confused young man who lives in constant fear of Terminators. I did not like Nick Stahls portrayal of John Connor (I just do not see any potential for a future resistance leader). I do think that Nick Stahl is right for this part (I would rather have seen Edward Furlong return as John Connor). Claire Danes plays John Connor’s future wife Kate Brewster. Claire Danes does at great job in the movie, and I am sure that she could have handled a more complex role than this (she is a great actress). The story writing for T3 is really weak, and we do not get any really character development. We are told that Judgment Day is inevitable. The first part of the movie feels like a lazy version of T2 with new vehicles and weapons. Fortunately, the action works very well in this movie (the crane sequence is great). The humor in the movie is really bad. The T-850 gets his leather jacket from a male stripper, and the T-X is able to enlarge her breasts. The scene with Arnold Schwarzenegger’s sunglasses did not work for me either. The T-X is supposed to be the most deadly Terminator yet (a kind of Terminator destroyer). I think the T-X is too overpowered (her arm contains both a plasma canon and a flamethrower). Besides, The T-X is also able to control other vehicles and machines. Apparently, it is not at problem for the T-X to get her built-in weapons through the time portal (in T1 and T2 weapons and clothes did not go through the time portal). Besides Arnold Schwarzenegger´s T-850 is able to self terminate, which I did not understand (this was not possible in T2). Arnold Schwarzenegger´s damaged fuel cells did not work well in the movie (the T-850 is damaged by the T-X the in beginning of the movie). I think T3 is too short, and some scenes seem to be missing from the movie (some more scenes from the future war would have been great). Skynet is now a computer virus which works all right in the movie. Fortunately, the last part of movie gets better (the machines start to rise). The apocalyptic ending scene was very well executed. T3 was directed by Jonathan Mostow, and apparently he was not able to fill the shoes after James Cameron (he wrote and directed both T1 and T2). 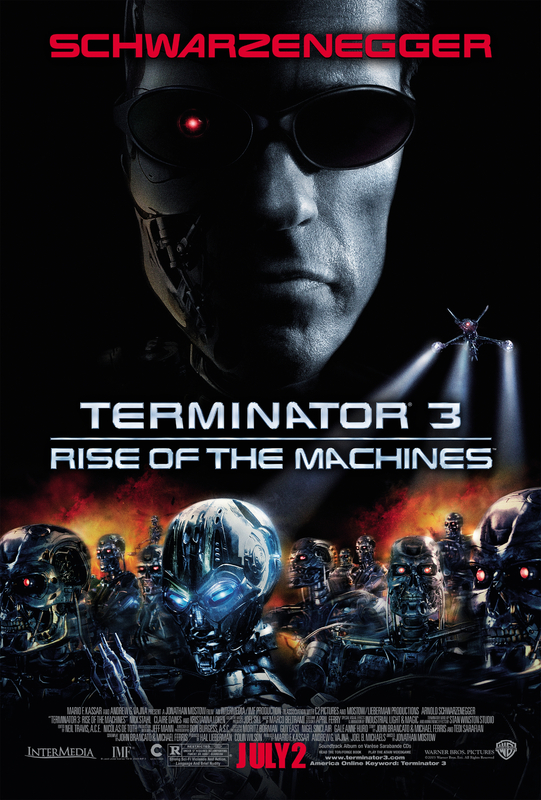 T3 was the first bad Terminator movie, and I am surprised that new movies in this franchise keep coming. T4 (Salvation) was also bad, but I quite liked T5 (Genisys). The next Terminator movie will be “Terminator Dark Fate” which brings back Linda Hamilton as Sarah Connor (directed by Tim Miller and produced by James Cameron). This should be the true sequel to T2 (ignoring T3, T4 and T5). There might be hope for Terminator fans after all. The story is not that thrilling and far from the level of the first two movies. It does not really have any content and worst of all, there is no real ending either. It did not really give me anything. I have never really liked Nick Stahl who is playing John Connor. He is very far from the young Edward Furlong from the second movie and does not really deliver in this movie. Claire Danes is very pretty, but for me she is just not suited for action movies. Arnie is his classic selv. Not a big actor but always good for some solid strong-man action. Kristanna Loken got a lot of geek credit for playing T-X. For me her performance was mediocre. This is a B-movie and only worth the time if you are a big fan of the two first Terminator movies.